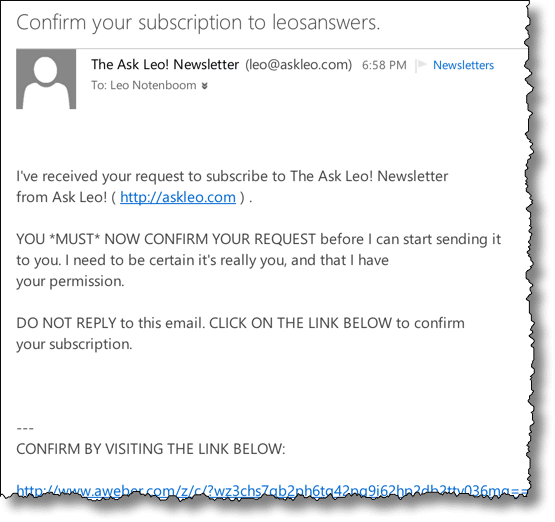 It confirms that you are indeed connected to Ask Leo!, and not an imposter. It encrypts the transfer of data between your computer and the Ask Leo! family of web sites. It causes errors in some older browsers and mail programs. The problem is one of continued support – or rather the lack there of. These programs are no longer being updated to support evolving standards that allow sites to support SSL/TLS connections without incurring significant additional expense. will generate a certificate error in programs that have this issue. Newer browsers will properly see the certificate as being that of “*.askleomedia.com”. Browsers without the proper support will see a certificate for “*.netdna-ssl.com” – the domain of the content delivery network being used. Use a supported software. By far this is my strongest recommendation, not because of the certificate error issue, but because your current software is no longer supported. You’re missing out on important security and other updates that could actually put you at risk of a malware infection or worse. Ignore the error. You can check that the certificate is from “*.netsna-ssl.com”, if you like, but even with the error you are at no more risk than when Ask Leo! was running without SSL at all. Ask Leo! will not be the only site to move forward with new technologies – technologies that your older software may not support. Use this as a safe example and an opportunity to determine how you’ll want to deal with this situation as it appears on more and more sites in the coming months. And thank you, as always, for being an Ask Leo! subscriber and supporter. Previous Post: « I never received your confirmation message, please subscribe me.